Star Hotel Budapest - Best Four Star Hotels in Budapest, Hungary. 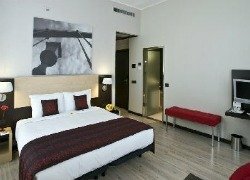 Are you looking for a 4 star hotel in Budapest? Since this is not an easy task considering that there is a wide range of great 4 star hotels in Budapest, we have made a careful selection of the best Budapest’s 4 star hotels based on friends’ experiences and on travelers reviews gathered from different forums. This list will help you compare and find more about location, facilities and quality of service of 4 star hotels in Budapest. Hopefully, the information you find here guides you to find the best choice for your needs. Find the best deal, compare prices, and read what other travelers have to say about the best 4-star Hotels in Budapest. Hotel Palazzo Zichy is a beautifully restored palace located in a very convenient place in central Pest surrounded by nice restaurants and coffee shops. It is within a short distance walk from blue metro line stops and tram lines 4 and 6. The river bank, the Hungarian National Museum and the Central Market are about 10 minutes walk from the hotel. Palazzo Zichy stands out for its cleanliness, comfortable rooms, excellent breakfast (included in room price) and friendly and efficient staff. Address: Lorinc pap ter 2, Budapest 1088, Hungary. Hotel Regnum Residence is a new hotel located in Buda, one block away from the Danube river bank, very close from Király baths and within a very short walking distance from Batthyanyi tér metro stop which quickly takes you any where in Pest. Regnum hotel is located in Víziváros, a nice and peaceful area very close to the Buda Castle and the Margaret island. This hotel offers modern facilities, comfortable rooms, complimentary drinks from minibar and very welcoming and warm staff. Keep in mind that the Hotel restaurant is not open in the evenings. Address: Ganz u. 8, Budapest 1025, Hungary. BEST Western Premier Hotel Parliament is located in a quiet area near the Pest side of the Danube, the Parliament House and the Budapest Basilica. It is very close to metro stations and tram stops, although, from here you could easily walk to all main Budapest attractions. This hotel offers spacious, cozy and neat rooms, rich buffet breakfasts (included in room price)and a nice wellness area.Tea, coffee and water are complimentary between 10:00 am and 5:00 pm at the hotel’s lobby. Free internet access, great amenities and its highly efficient staff make the Best Western Premier Hotel Parliament a very good value for money accommodation alternative. Address: Kalman Imre utca 19, Budapest 1054, Hungary. Opera Garden Hotel & Apartments can be found in a nice pedestrian street and a great central location in Pest. The Budapest Opera House, Andrassy Avenue, Budapest Basilica and Váci street are a short walking distance from the hotel. This area is surrounded by lots of great restaurants and coffee shops. The hotel’s facilities are modern and high standard, rooms are tastefully decorated in contemporary style and count with a very convenient and modern kitchenette. Free wifi internet in rooms, flat screen tv, quiet air conditioned and L’Occitane amenities in bathrooms. Friendly and helpful staff. Address: Hajos utca 24, Budapest 1065, Hungary. K+K Hotel Opera is a modern business oriented hotel located right next to Budapest’s Opera house, a very nice area half block away from Andrassy avenue, a great place for cool restaurants and coffee shops. It is within walking distance from Budapest’s Basilica, House of Terror, Great Synagogue and almost all Budapest’s attractions in Pest. 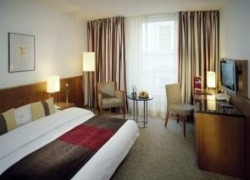 K+K Hotel Opera offers clean, comfortable rooms with modern facilities including coffee and tea maker. Breakfast buffet is extensive and varied. Internet service in hotel’s lobby, use of PCs and printer at the lobby is free of charge. If location really matters to you, K+K Hotel Opera is the perfect place to walk to all Budapest’s landmarks. Its staff is courteous, professional and always willing to help. Address: Revay utca 24, Budapest 1065, Hungary. Mamaison Hotel Andrassy Budapest is a great hotel located in a very nice area on beautiful Andrassy avenue in Pest; it is very close from Heroes’ Square, Szechenyi Baths, the Budapest City Park, the Budapest Zoo, the Museum of Fine Arts and Budapest’s Hall of Arts. Although, this hotel is not located in central Pest, the yellow metro station you find nearby makes it accessible from anywhere in the city. 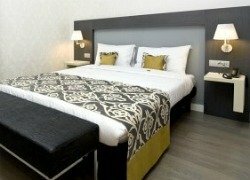 Mamaison Hotel offers spacious, modern and comfortable rooms equipped with all facilities, included kitchenettes. The hotel’s restaurant, the peaceful and pretty area where it is located, its comfortable rooms and the extremely helpful and kind staff make this hotel a great place to stay in Budapest. Address: Andrassy ut 111, Budapest H – 1063, Hungary. Fraser Residence Budapest opened in 2011, this luxurious apartment hotel is centrally located next to the Corvin Shopping Centre and 500 metres from the Corvin-negyed metro stop. All rooms are soundproofed and include free Wi-Fi. Offering all amenities of a 4-star-superior hotel, Fraser Residence Budapest features stylish interior design combined with a spacious layout and modern comfort.They are all air-conditioned and have a well equipped kitchen with a dining area. They have flat-screen satellite TV and DVD player. Some apartments include a living area with comfortable leather sofas, a private balcony or terrace and a laptop safe box.The Fraser Residence Budapest is located on the Pest-side of the city, just off the Corvin Promenade, close to many bars, restaurants and shops. A 3,000 m² spa area is located 50 meters from the property. It features a pool and a fitness centre. 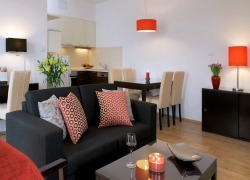 The apartments at Residence Fraser are fully serviced and continental breakfast is also available. The reception is open 24 hours a day. Address: Nagytemplom utca 31, Budapest 1082, Hungary.